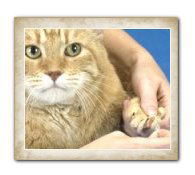 Applying Soft Paws® is easy! 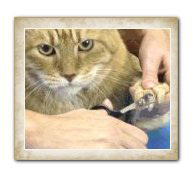 Watch our new video on How to Trim Your Cat's Claws! 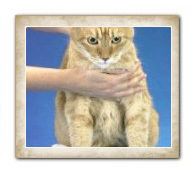 FOR KITTENS: Do not trim kittens' claws before applying Soft Paws. You will need sufficient claw surface for the glue to adhere properly. STEP 1: Trim the tip of your cat's nails. Trim just enough to allow the nail cap to fit all the way to the base of the nail. Watch a video tutorial here. STEP 2: Fill nail caps 1/3 full with adhesive. 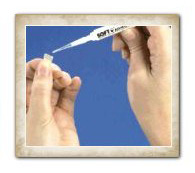 Gently squeeze the nail cap to evenly distribute the glue and release any air bubbles. If the glue oozes out of the nail cap, you have inserted too much adhesive. Remove some of the glue by squeezing it onto a paper towel. STEP 4: Observe cat for five minutes before release. You can play with your cat or feed some of kitty's favorite food to distract for a few minutes.